I ought to post after a small gap. Or I could do work. 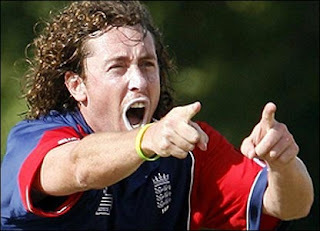 Next up is England's frankly amazing victory over the big, ugly meanies from Oztraya. To be honest, we deserved to win too, despite being perfectly capable of losing to Bhutan only three weeks ago. The much vaunted Irish went out aaaaaaaaaaaages ago which is always amusing but really the most satisfying victory imaginable for English rugby fans (of which I'm no more than merely a late bandwagon jumper - can't be bothered most of the time) is over the aussies. It doesn't happen often, so we have to enjoy them when it does! As a bonus NZ got knocked out by France meaning we don't have to play the best team in the world in the semi-final. 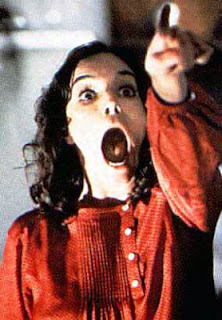 A good natured ribbing was handed out to kiwigirl which ended up with an invite to London for a weekend soon. Result! Switching sports, England had a chance at winning the F1 driver's championship via Lewis Hamilton in China this morning but as usual we didn't. 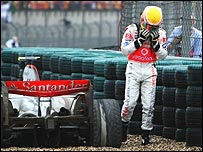 Lewis was in the lead and practically cruising to the championship but inexplicably mistook a gravel trap for his pit and was out, making the final race in two weeks time into a three-way tussle for the crown between Lewis, Alonso and Raikkonen. 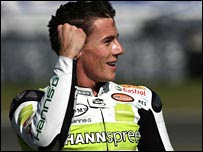 In motorcycling however, James Toseland captured the World Superbike Crown to become the first Brit to win it for, oooooh, ages. Possibly ever. I don't really follow it either, but here's a picture anyway. And finally to cricket, where after 25 years of failing to win a ODI in Sri Lanka, we've now won two in a row to go 2-1 up in the series with two to play. After bowling Sri Lanka out for 164-8 in less than 42 overs, we were set 164 in 48 overs after a bit of rain. The pitch turned out to be a bit of nightmare for the batsmen and England struggled to 140-8 with no recognised batsmen left. Chris Broad steered us home with 7 balls to spare for a hard-fought victory. Unbeaten in six yet Jol's still in the firing line :-S! Auntie's licence goes a long way these days, hehe!